(female) containing the egg to be fertilized. H, a new Adiantum (sporophyte) attached to the prothallus with a juvenile frond and developing root system. of a specific fungus, known as mychorrizae to invade the gametophyte to help the sporophyte develop. generally known as pteridophytes, also includes plants that are called the fern allies. the lycopods dominated the landscape; they were giants among plants. ferns because they produce flowers and seeds. section is known as the pinnule. for them, they are never-the-less a necessary component in what a fern is. Many ferns are identified by the type of sori they have. veins on the pinnae, or simply may cover the entire underside of the frond. there are special spoon shaped lobes bearing the sporangia. 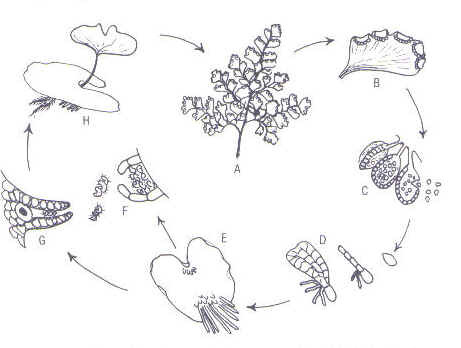 to produce bulbils on their fronds. There is a much greater list. a much broader spectrum of ferns that produce bulbils, bulblets, babies, pups, etc.